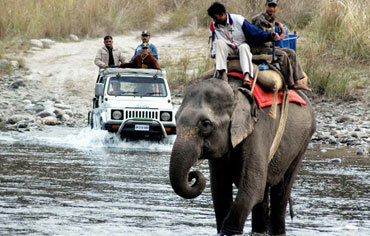 Jeep safari in Corbett is the amazing and exciting way in which you can swindle through the Jim Corbett national park. 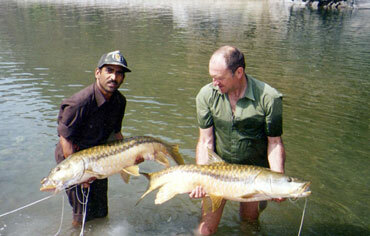 Your tryst for exploring wild life and flora in their natural will be realized through Jeep Safari. Jim Corbett National Park plans out day visit safari two times in a day and there is a time schedule of morning and evening. There are only 30 open jeeps, which can be permitted at any point of time. 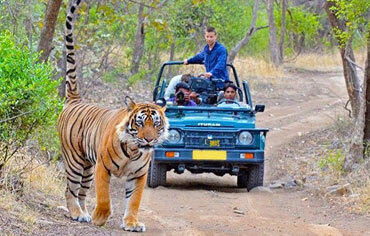 The three popular Jeep Safari Zones are Bijrani, Jhirna, Corbett Landscape and Durgadevi. The elephant safari in the Jim Corbett National Park begins from Corbett Landscape or the Ramganga valley and gradually crosses through the Mandal valley, casing through some of untouched tracts of forest before finally ending at the splendid forest Resthouse of Halduparao in the Palain Valley. The wildlife, which can easily be sighted includes Elephant, Spotted deer, Barking deer, Sambar, Ghoral (Mountain goat), Rhesus &Langur monkey, Wild boar, Jackal, Civets, Porcupine, etc. Garjiya Devi Temple is a noted Devi temple located in the Garjiya village near Ramnagar, Uttarakhand, India, on the outskirts of the Corbett National Park. 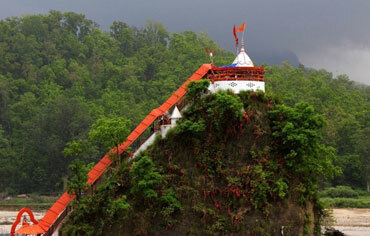 It is a sacred Shakti shrine where Garjiya Devi is the presiding deity. The temple is situated over a large rock in the Kosi River and is one of the most famous temples of the Nainital district, visited by thousands of devotees during Kartik Poornima, a Hindu holy day celebrated on the fifteenth lunar day of Kartik (November – December). © Pratiksha River Retreat All rights reserved.